In the sold-out NOSPR concert hall in Katowice, 1800 people applauded on Friday evening, April 6th, the performing artists and the National Polish Radio Symphony Orchestra at the 8th Gala concert of the International Classical Music Awards (ICMA). 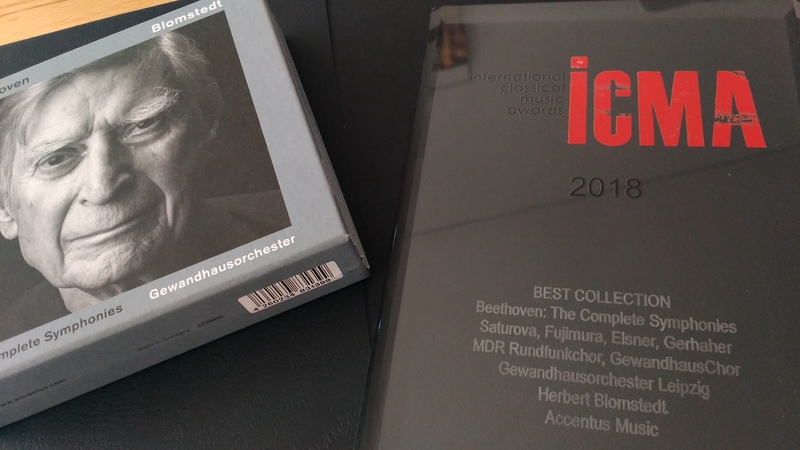 Accentus Music’s new Beethoven cycle with conductor laureate Herbert Blomstedt and the Gewandhausorchester Leipzig received the award as “Best Collection” . For more information about the Gala concert, click here. Here’s the jury’s explanation: Herbert Blomstedt’s interpretation of Beethoven’s Symphonies is based on a highly responsible handling of these famous scores stemming from a deep love of musical truth. Overall, they sound coherent, natural and immensely rhetoric. The music is constantly flowing and always admirably transparent. The fast movements sound fresh, with splendid rhythmic bounce, while the slow movements have warmth and are strikingly beautiful. The orchestral playing is of high quality, and the recorded sound is very good. For more information about the cd box set, click here.